This four hander played to thousands of people during the summer of 2008 at the Mayfield Dinner Theatre (formerly Stage West) in Edmonton. 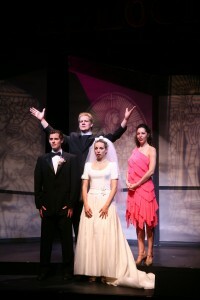 Bridget Ryan and her husband David Horak had been commissioned to write a musical on the theme of marriage in the 21st century, so in the September of 2007 when everybody had just returned from mounting THE WINTER’S TALE PROJECT at the FringeNYC which was a tremendous success it just seemed a good idea for them to ask Chris to join the team. There was a short workshop done at Grant MacEwan University in early May, 2008 and the show went into rehearsals at the beginning of June. WedLOCKED opened on July 4 and ran until August 28.